Little girlhood these days is the land of pink and princesses, seemingly more than ever before. In Cinderella Ate My Daughter, Orenstein recounts how the Girl Power of the 1990s has morphed to become a girl culture that is all about looks. Little girls are typically complimented on their looks while boys get complimented on intelligence or achievement. What does this obsession with looks and femininity do to our daughters, and how do we combat it? I’ve been aware of Orenstein’s book since it was published last year, but hadn’t even gotten around to picking it up. Once I had twin daughters, though, it suddenly seemed like a more important book to read. Orenstein lays out her premise very clearly and in an interesting and easy-to-understand manner. The anecdotes about the extreme princess-ization (I’m pretty sure I just made that word up, shh!) of young girls was a bit troubling – not to mention something I was observing myself, as at least 1/4 of the outfits the girls have seem to say “princess” on them. I’m still not sure that I’m 100% sure that the princess-phase leads to the overly precocious sexytimesgirl phase, but much of what Orenstein writes about the commoditization of girlhood and femininity rings very true. I would have loved some concrete ways to fight this problem at home, but unfortunately it is a societal issue – even girls whose mothers think they are sheltering them from the princess phenomenon are going to learn about it elsewhere. Still, there was information that seems directly helpful in the process of raising girls, even if most of the information is philosophical and societal. Orenstein is very passionate about this topic; it is something that she became personally interested in after having her own daughter and worrying about how the girlie-girl culture affects her. 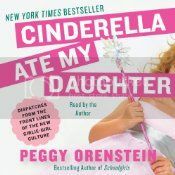 I’m generally hesitant to listen to audiobooks narrated by the author, but Orenstein’s enthusiasm makes her narration interesting to listen to and in turn make Cinderella Ate My Daughter all the more engaging. A fascinating exploration of little girl culture and the impact it has on the way that girls are raised. Recommended. I have this in print and look forward to reading it. I’m sure it’s not without controversy, but I think it sounds fascinating. I do find some of the “princess” stuff over the top. There is a salon here for girls – they do manicures, pedicures, etc for girls – and the 3 year old down the street goes there regularly. I can’t help but wonder what kind of expectations she’ll have as she grows up. I read this in print a while ago, and I agree that it was a fascinating read. But it was definitely troubling and frustrating that there doesn’t seem to be much for parents to do in the hopes of sheltering their daughters from this culture. It seems like, as you said, it’s a societal issue and not a personal one. Good read but made me a little nervous to have a daughter someday. Oh gosh, I’ve wanted to read this one for awhile. Now that it has your seal of approval I’m itching to hop over to the library on my lunch break and grab this sucker! We did our darnedest to not buy tons of Disney princess stuff for the girls and we didn’t have much money when they were little, anyway, so it worked out well! 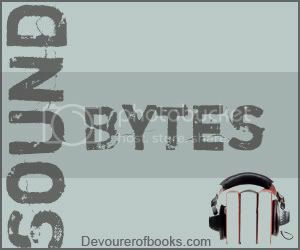 Cinderella Ate My Daughter sounds like a good nonfiction audiobook match for my Sound Byte link today: Beauty Queens, the YA novel by Libba Bray that takes on the teen beauty pageant culture, marketing to girls and women, and the whole culture of beauty for women. Libba Bray is also a great author as narrator! Maybe Audiobook Week was when I finally bumped Beauty Queens up the TBL list! I started this book awhile back but ended up letting it go back to the library unfinished. I found it very interesting just not always a book that I wanted to read after a long day at work It was very enlightening especially when I have a very girl-ey daughter who likes anything and everything pink. Yikes! LOL! Thanks for making me want to go back and finish it! I still think parents can empower their own daughters to grow up strong, believing they can accomplish just as much as boys. That’s how my parents raised me and my two sisters. My dad (an Italian immigrant) told us we can do anything and he told us how lucky he was to have 3 girls. He never voiced wanting a boy. I love my dad for that! Oh, sure, but the climate for girls is more pervasively princess-y then when were little, making it harder. Case in point: why on earth do we need legos (or pens) specifically for girls? Thanks for reminding me about this book. My daughter’s adoption was just finalized this month so after 8 years of being a mom to only boys, I have to worry about this stuff now! I’m with you – why do we need pink Little People school buses and airplanes??? I read this book before I found out I was pregnant with twin girls (who will arrive in the next month or so). I agree with being disappointed that Orenstein never really shared any conclusions or guidance based on the topic she was presenting.